Ferryspeed’s Warehouse Manager has completed a five mile run for the second year in a row to raise money for a local mental health charity. 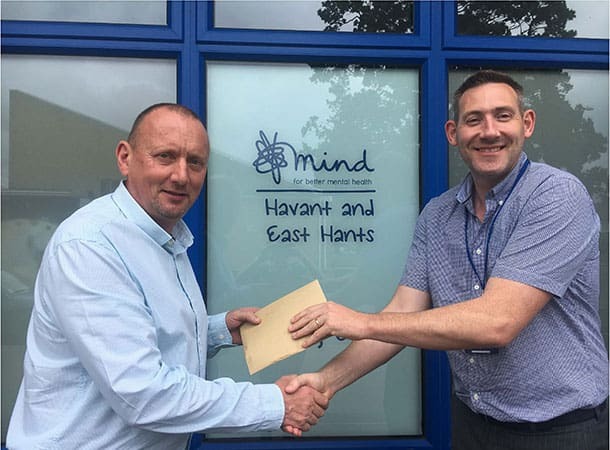 Kevan Lee raised £620, thanks to the support of fellow Ferryspeed employees, for a campaign run by Havant and East Hants Mind called Kids in Havant. The money raised means that Kev remains the highest individual fundraiser for the charity, following his run last year which raised £715. Kev ran with four others, one of which was his wife Kelly who is a former Ferryspeed employee, and in total they raised £1000 for Mind. Kev completed the run in 59 minutes despite not doing any training. “It was quite tough as it was a warm evening so I had to really persevere. But I was pleased to do it in under an hour. “Once again my Ferryspeed colleagues were extremely generous with their donations. The money is going to a great cause and, most importantly to me, one which is local,” added Kev. More than 320 people took part in the annual charity event organised by Victory Athletics Club, all raising money for different causes. Ross Borman, Development Manager at Havant and East Hants Mind, said that the Hayling Billy Run will now be a permanent feature in the charity’s fundraising calendar. “We’re very fortunate to get local authority funding for our adult services but coverage for children is patchy, so we rely on a range of sources,” he explained. “That means that individual fundraisers, like Kev, make a big difference to our children and families work. Once again, Kev was the biggest single fundraiser for us at the event; he really got behind it and has successfully raised the profile of Mind,” Ross added. Mind provides one-to-one support for children suffering from poor mental health including anxiety, depression and a range of other mental health conditions. In addition, it works with parents, siblings and schools to ensure the right help is provided at the right time.